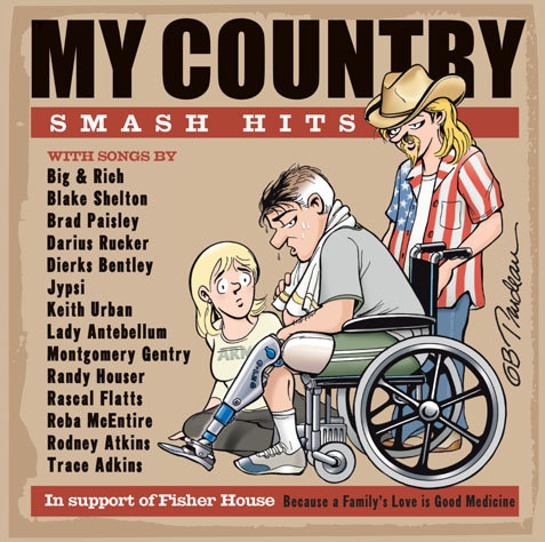 Fisher House Foundation will be the beneficiary of proceeds from Stadium Entertainment’s release, My Country: Smash Hits, a compilation of songs from country music stars Trace Adkins, Rodney Atkins, Dierks Bentley, Big & Rich, Rascal Flatts, Randy Houser, Jypsi, Lady Antebellum, Reba McEntire, Montgomery Gentry, Brad Paisley, Darius Rucker, Blake Shelton and Keith Urban. The album was released on August 24 and had already reached #133 in Music and #15 in Country Music on Amazon’s Bestsellers Rank as a result of album pre-orders. Fisher House Foundation, which celebrates its 20th Anniversary this year, builds “a home away from home” for families of patients receiving medical care at major military and VA medical centers. The homes are normally located within walking distance of the treatment facility or have transportation available. There are 45 Fisher Houses located on 18 military installations and 15 VA medical centers. Twelve more houses are under construction or in design. “We appreciate the generosity of these great country artists and their decision to share their music in support of the Fisher House mission. The partnership with Stadium Entertainment and EMI is one that will greatly help our military families. Fisher Houses are sanctuaries of support – and the proceeds from this CD will further demonstrate to our wounded warriors and their loved ones that they are never alone and have the devotion of country music fans all around the world behind them,” said Ken Fisher, Chairman of The Fisher House Foundation. The cover of the album was also designed by legendary “Doonesbury” creator, Garry Trudeau. Orders are available via Amazon.com or by calling 1-800-5-STADIUM. Fore more information, visit www.mycountrysmashhits.com or www.stadiumentertainment.net. For more information on Fisher House, visit www.fisherhouse.org.